Happy Wednesday! I'm SOOOOO excited! For this entire month of October, I'm celebrating my birthday by showcasing some of the wonderful scrappy friends that I have met. This has been a wonderful journey for me since I started blogging in June of last year. Who would have thought that I would meet so many wonderful people via the internet. Today, we have Michelle. She is an amazing artist and one of the first bloggers that I stalked when I started blogging. She has some of the BEST tutorials out there! If you haven't been to her blog, you're missing out! She put together a video just for me. I'm so excited. Please enjoy her project. Be sure to stop by her blog, Scrappin With My Bug, and show her some love. As a prize for commenting on my blog and showing some love to my wonderful friends, I have a copy of the My Memories Suite software to give away to one of my followers and commenters. I must say that I have fallen in LOVE with this software. 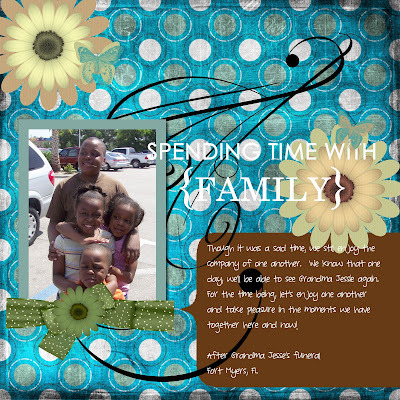 It's so easy to create a beautiful layout, card, or other digital project in minutes. Here is a sample of a recent layout that I created using the software. 1. In order to be eligible for the My Memories Suite Birth Month Giveaway, here is what you need to do. 1. Be a follower of my blog. 2. Go to the My Memories Suite website and check out their digital paper packs. In your comment under this post, tell me which paper pack is your favorite. 2. Visit my bloggy friends and leave them some love. Extra chances to win can be gained by doing the following. 3. Follow My Memories Suite on Twitter. Come back and leave another comment for an additional chance to win. (One per person for the month). 4.Share this giveaway on your blog or Facebook. Come back and share a link to your post with me for an additional chance to win. If you would like to go ahead and purchase the software, wouldn't you like to save $10 on the software and then a $10 gift certificate to the store? Well...click on my banner below to claim both! Be sure to enter code STMMMS93181 at checkout. I promise you won't regret it! Happy scrappin'! I love you and there ain't nothing you can do about it! thanks for having me ~ hope you have a wonderful birthday month !! !